"A bubble spring, gift of the gab and very intelligent. A good lad." 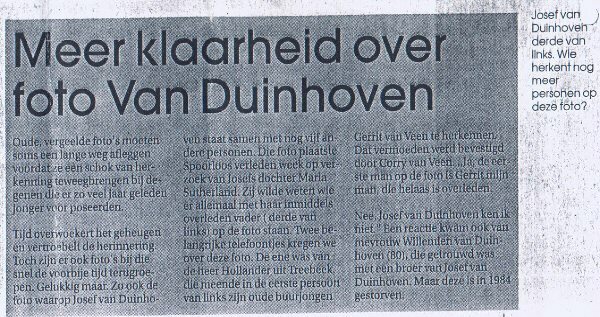 That is the way Andre Caris describes his former brother-in-arms and comrade, Josef van Duinhoven, the man whose Limburgs past his daughter is feverishly seeking. For Maria help comes from Andre Caris from Hoensbroek, a fast speaking and friendly man in his seventies. He remembers Josef van Duinhoven real well. Because they shared a lot of life and sorrows together. First as soldier in the Dutch Indies and later as mine workers in Limburg. There is no period that Caris doesn't remember without sadness. "Horrible, First that war, later that mine while our Prince Bernard had promised us that upon return home, not a single Limburger would have to return to the mines. As Bernard had said, we were all allowed to become policemen. That is something we didn't mind. Better work and no longer having to go underground. But fine, they didn't pass a single one of us Limburgers. We had no choice but to return to the mine. I was forced to, I wasn't given a house and lived with my family in an attic room. Every day I went to the mines crying" says Caris. You can still hear the helpless anger in his voice. Caris: "I knew 'Jopie' since I was five years old. I knew him and his whole family really well. 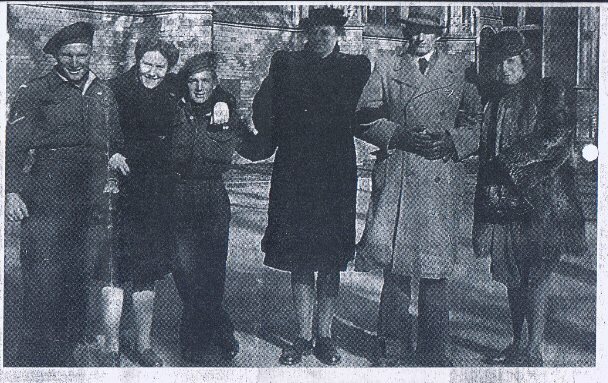 Jopies' Grandfather was the undertaker of the Sint Jans Church in Hoensbroek, from 24 to 30. Jopie was like a brother to me. We lived in a mineworkers area, the 'Slak' in Hoensbroek." Together with the four year older Jopie van Duinhoven, Andre Caris was assigned to the commando: Stoottroepen (Stormtroops) 1RS, Caris adds. "We were in England, France, Germany and the Dutch Indies. To fight. The Dutch Indies was bad. Especially the trip there. We were aboard the 'Al Kantara', which was called: 'The ship of death'. We were starving. We got nothing to eat. Only corned beef with maggots." Finally the commando's arrived in Central-Java. "A Terrible time. To see two thousand of our comrades die." And then after returning home another disappointment. Prince Bernard who make them happy with a false promise. They were all forced out of need, back into the mines. Else there would be no bread on the table. "Jopie and I landed together in the mine. I stayed there for thirteen years, and every day I went there crying. Jopie was very fast, handy and intelligent. He was a light stringer. Heavy work, all that hauling and dragging those pipes. But Jopie knew exactly how to do it. A radiant, cheerful lad he was." Yet they lost sight of each other. Because one day Caris heard that his mate Jopie had left for Canada. "Yes, he was smart enough to immigrate there." Andre Caris is shocked when he hears that Jopie has been dead for more than twenty years. 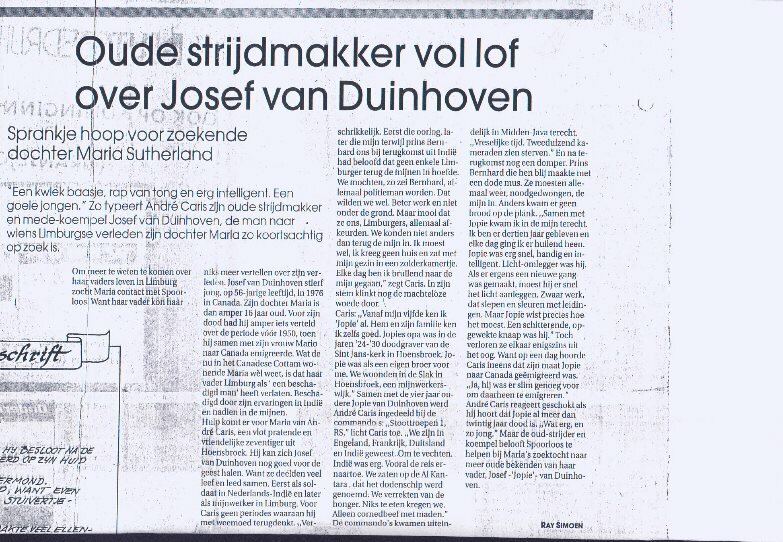 "How sad, and so young" but the old fighter and comrade promises the 'Spoorloos' to help Maria find more old acquaintances of her father, Josef 'Jopie' van Duinhoven.